MarineCadastre.gov is a great source for AIS data along the US coast. Their data formats and tools though are less open. 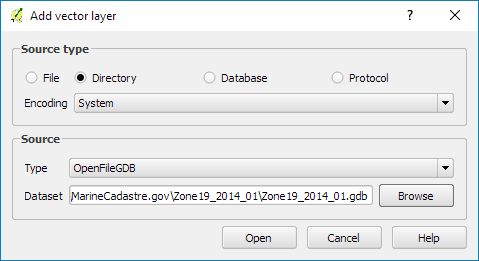 Luckily, GDAL – and therefore QGIS – can read ESRI File Geodatabases (.gdb). MarineCadastre.gov also offer a Track Builder script that creates lines out of the broadcast points. (It can also join additional information from the vessel and voyage layers.) 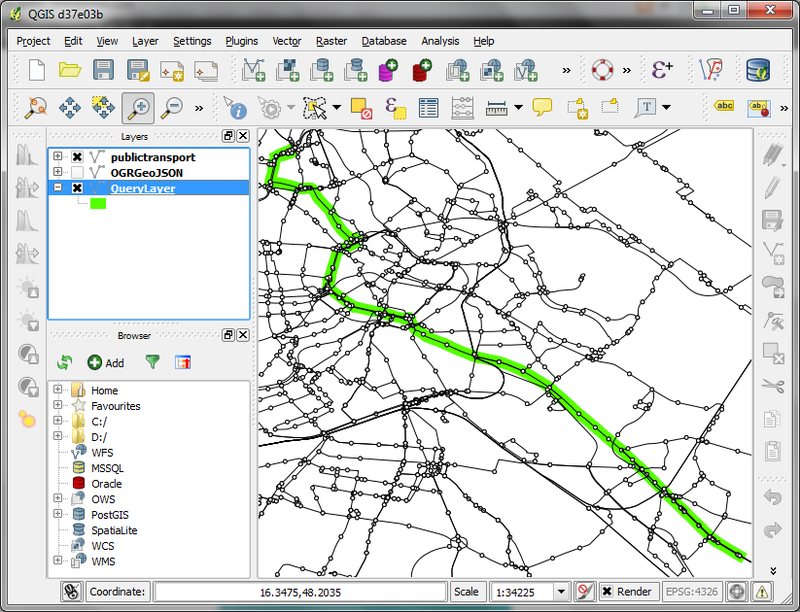 We could reproduce the line creation step using tools such as Processing’s Point to path but this post will show how to create PostGIS trajectories instead. 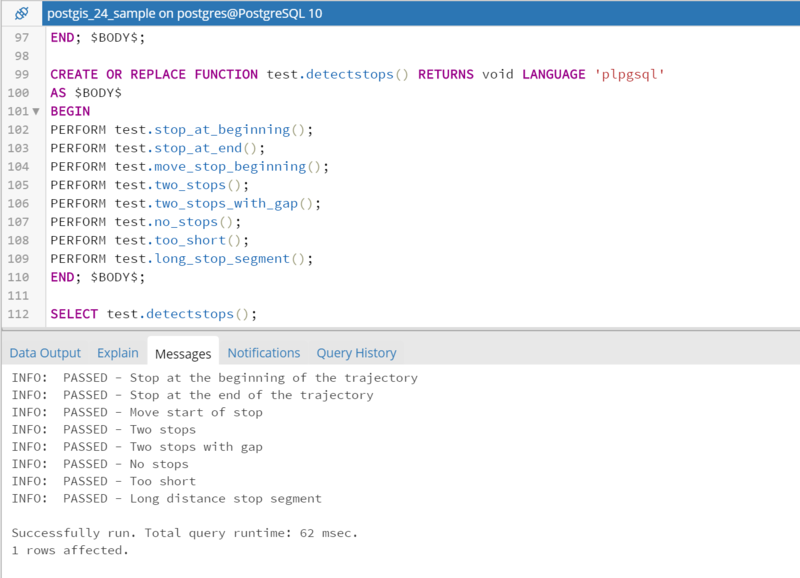 The first part of the query creates a temporary table called ptm (short for PointM). This step adds time stamp information to each point. 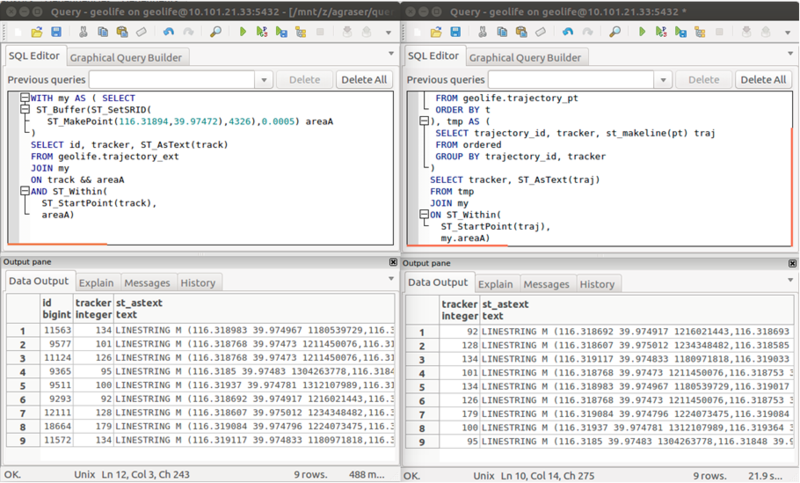 The second part of the query then aggregates these PointMs into trajectories of type LineStringM. 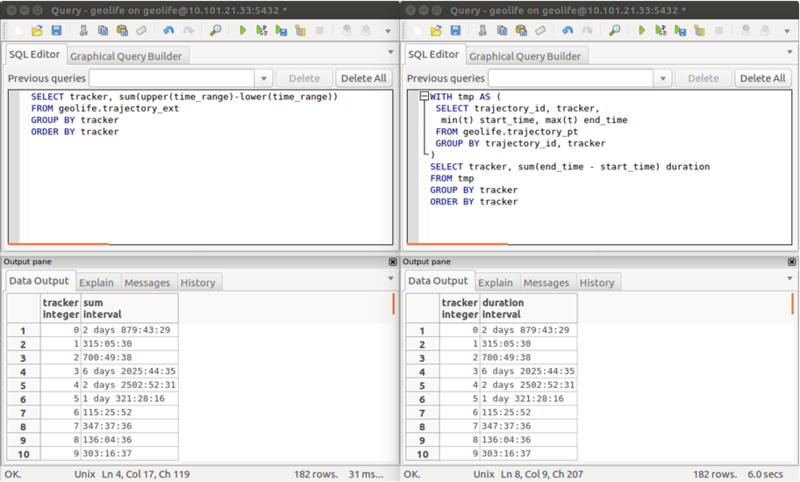 The trajectory start and end times (min_t and max_t) are optional but they can help speed up future queries. Of course, we end up with some artifacts at the border of the dataset extent. (Files are split by UTM zone.) Trajectories connect the last known position before the vessel left the observed area with the position of reentry. This results, for example, in vertical lines which you can see in the bottom left corner of the above screenshot. This is a first proof of concept. 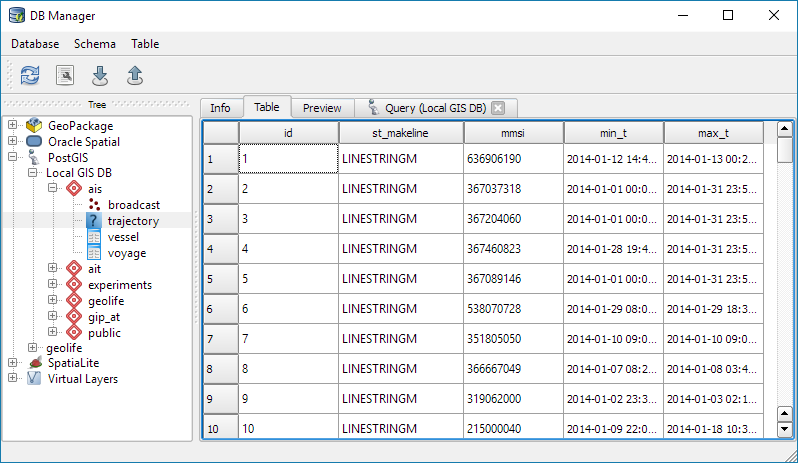 It would be great to have a script that automatically fetches the datasets for a specified time frame and list of UTM zones and loads them into PostGIS for further processing. In addition, it would be great to also make use of the information in the vessel and voyage tables, thus splitting up trajectories into individual voyages. 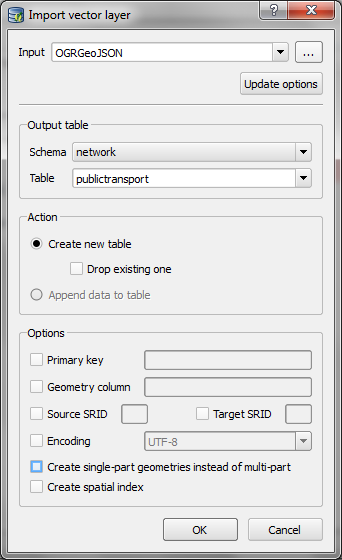 Since I’ve started working, transport and movement data have been at the core of many of my projects. 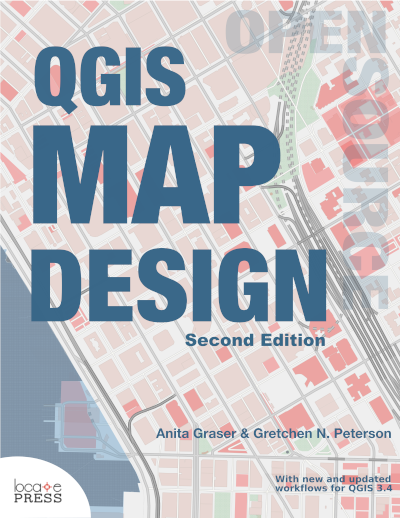 The spatial nature of movement data makes it interesting for GIScience but typical GIS tools are not a particularly good match. It’s still a hot topic right now, as the variety of related publications and events illustrates. For example, just this month, there is an Animove two-week professional training course (18–30 September 2016, Max-Planck Institute for Ornithology, Lake Konstanz) as well as the GIScience 2016 Workshop on Analysis of Movement Data (27 September 2016, Montreal, Canada). Most commonly, movement data is modeled as points (x,y, and optionally z) with a timestamp, object or tracker id, and potential additional info, such as speed, status, heading, and so on. With this data model, even simple questions like “Find all tracks that start in area A and end in area B” can become a real pain in “vanilla” desktop GIS. Even if the points come with a sequence number, which makes it easy to identify the start point, getting the end point is tricky without some custom code or queries. 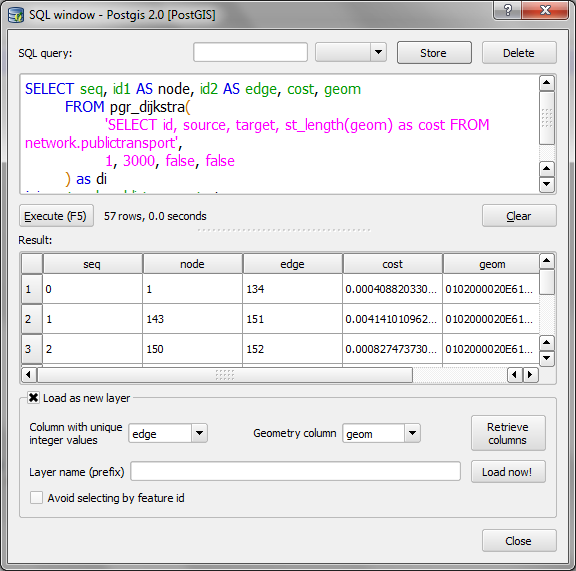 That’s why I have been storing the points in databases in order to at least have the powers of SQL to deal with the data. Even so, most queries were still painfully complex and performance unsatisfactory. ST_ClosestPointOfApproach — Returns the measure at which points interpolated along two lines are closest. ST_DistanceCPA — Returns the distance between closest points of approach in two trajectories. ST_CPAWithin — Returns true if the trajectories’ closest points of approach are within the specified distance. Overall, it’s an interesting and promising approach but there are still some open questions I’ll have to look into, such as: Is there an efficient way to store additional info for each location along the trajectory (e.g. instantaneous speed or other status)? 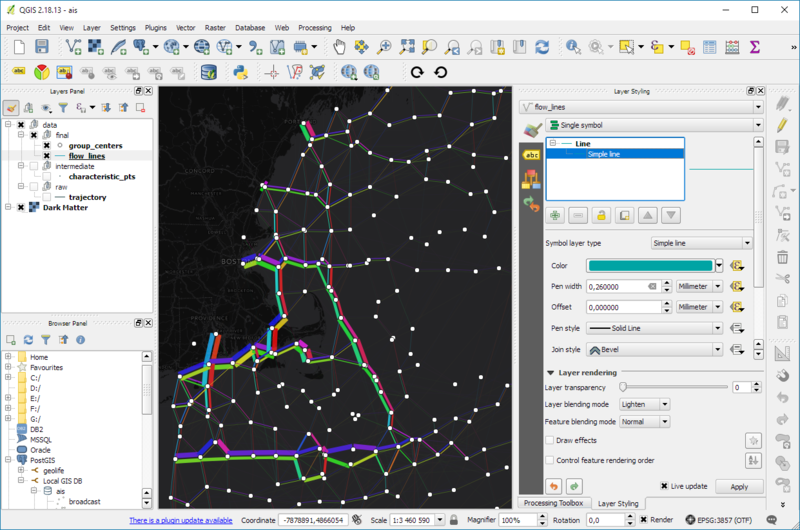 How well do desktop GIS play with LinestringM data and what’s the overhead of dealing with it? 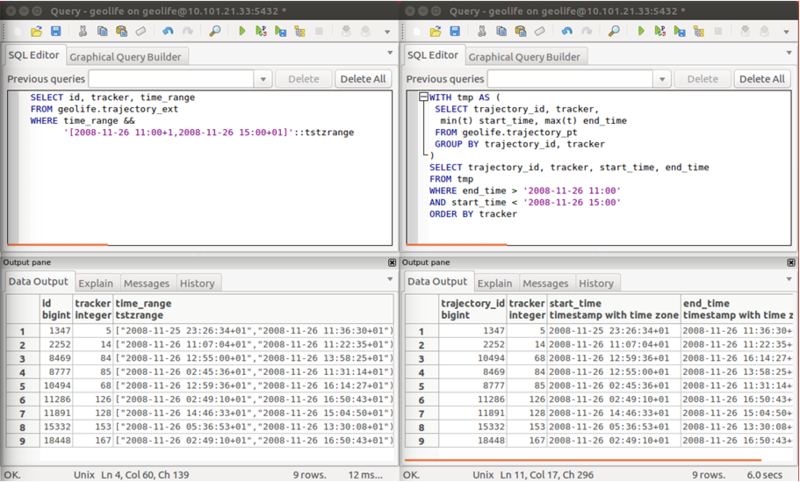 This post is a quick instruction for installing Postgres 9.2, PostGIS 2.0 and pgRouting 2.0. 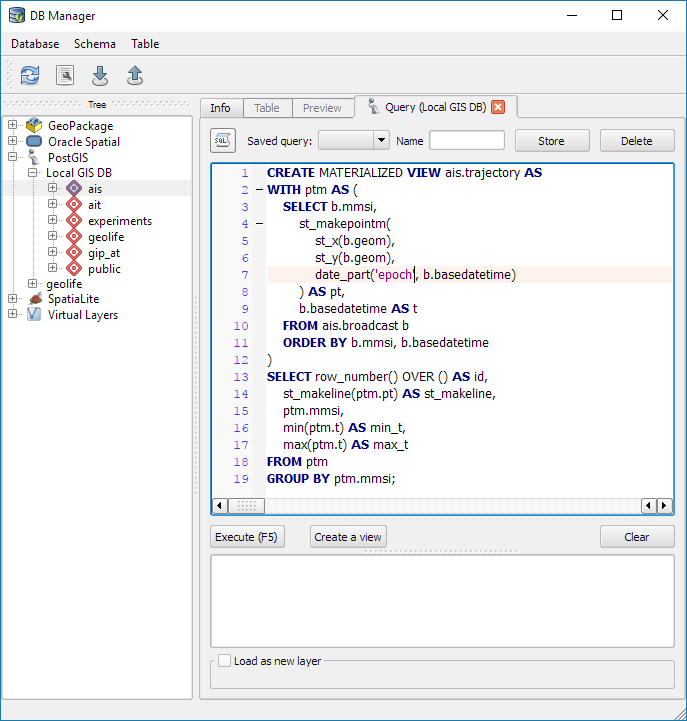 For Postgres, download the installer from enterprisedb.com. Run the installer. You’ll have to pick a superuser password – remember it, you’ll need it again soon. At the end of the installation process, allow the installer to start Stack Builder. 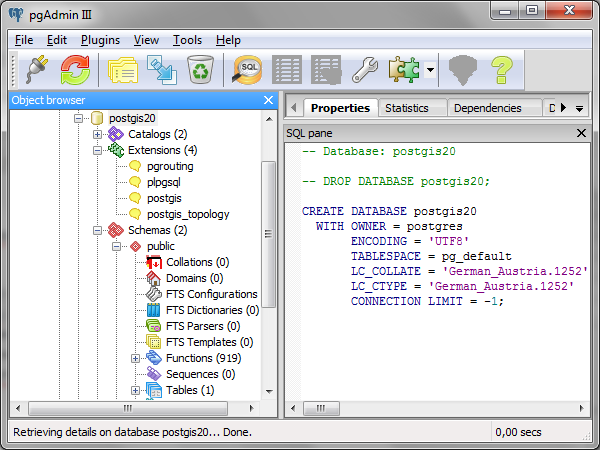 In Stack Builder, select the Postgres 9.2 installation and install PostGIS from the list of available extensions. The PostGIS installation procedure will prompt you for the superuser password you picked before. I suggest letting the installer create a sample database We’ll need it later anyway. Download the pgRouting zip file for your system (32 or 64 bit) from Winnie. Unzip the file. It contains bin, lib and share folders as well as two text files. It should return "(2.0.0-dev,v2.0.0-beta,18,a3be38b,develop,1.46.1)" or similar – depending on the version you downloaded. Just copy paste the url in Add Vector Layer | Protocol to load the dataset. I’m quite generously using a tolerance of 0.0001 degrees to build the topology. Depending on your dataset, you might want to be more strict here. Nice work! pgRouting 2.0 has come a long way. In a post from April this year, Boston GIS even announced to add pgRouting into the Stack Builder. That’s going to make the installation even more smooth. 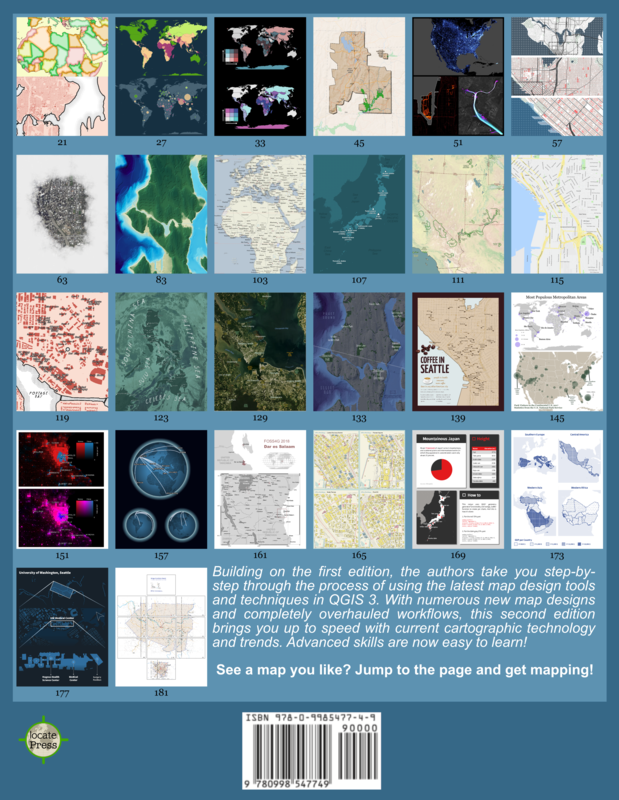 This is an update to my previous post “WFS to PostGIS in 3 Steps”. 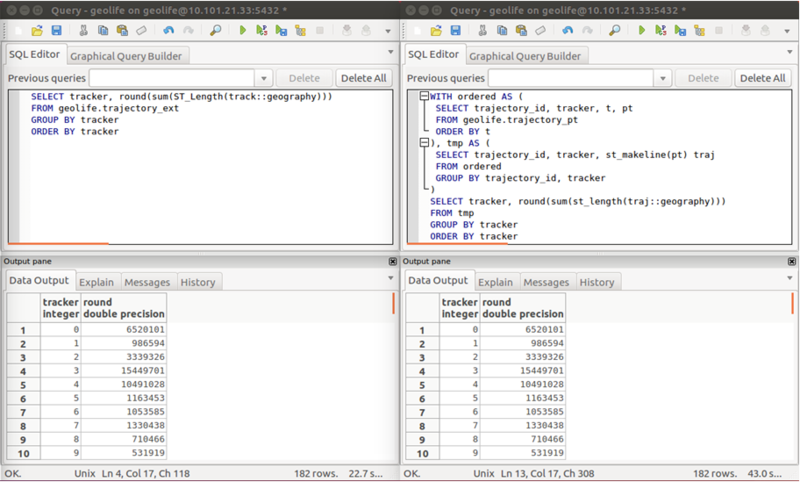 Thanks to Even Rouault’s comments and improvements to GDAL, it is now possible to load Latin1-encoded WFS (like the one by data.wien.gv.at) into PostGIS in just one simple step. C:\release-1600-gdal-mapserver>ogr2ogr -overwrite -f PostgreSQL PG:"user=myuser password=mypassword dbname=wien_ogd" "WFS:http://data.wien.gv.at/daten/geoserver/ows?service=WFS&request=GetFeature&version=1.1.0&typeName=ogdwien:BEZIRKSGRENZEOGD&srsName=EPSG:4326"
Thanks everyone for your comments and help! Now, I’d just need a loop through the WFS Capabilities to automatically fetch all offered layers … Ideas anyone? 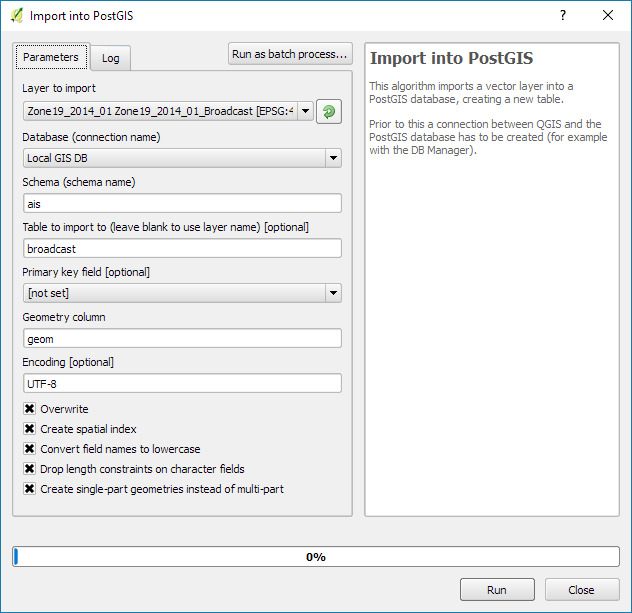 Thanks to Tim for his post “Batch importing shapefiles into PostGIS” which was very useful here. Update: Many readers have pointed out that ogr2ogr is a great tool for this kind of use cases and can do the above in one line. That’s true – if it works. Unfortunately, it is picky about the supported encodings, e.g. doesn’t want to parse ISO-8859-15. In such cases, the three code lines above can be a good alternative.